The Engineering Society at St John's offers opportunities for St Johns' Engineers to socialise and further their understanding of the subject through organised events. The society currently has over 90 members. All Engineering undergraduates and graduates studying at St Johns are granted automatic membership. Early in the Michaelmas term a meal is organised to welcome new Engineering students to the College. This is a great opportunity for the Freshers to get to know students from other years within the college, and share their experiences of the course and their time at Cambridge . This provides an opportunity for all of the Undergraduates, Graduates and Fellows from St John’s to mix socially. At a previous dinner, a very popular presentation was made by Professor Ian Liddell, an alumini engineering student from the college and designer of the Millenium Dome. 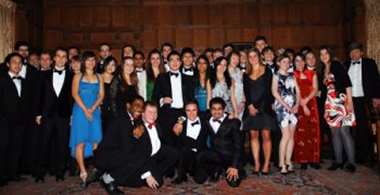 Several times during the year the Parsons Society organises a formal hall in College, which all members are welcome to attend. To celebrate the end of year, the Society holds a garden party in the Fellows Garden. This is a popular event with most Engineers from the College attending. The Committee of the Society may also organise visits to Industry and Speakers to visit the college during the year. The society is usually run by three undergraduates and a senior treasurer who are appointed based on applications received for the positions during the end of the Easter term.